Conduits are pipes or channels that move water from one node to another in the conveyance system. Their cross-sectional shapes can be selected from a variety of standard open and closed geometries. Most open channels can be represented with a rectangular, trapezoidal, or user-defined irregular cross-section shape. 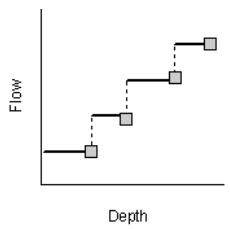 For the latter, a Transect object is used to define how depth varies with distance across the cross-section. Most new drainage and sewer pipes are circular while culverts typically have elliptical or arch shapes. Elliptical and Arch pipes come in standard sizes that are listed in Appendix A.12 and A.13. The Filled Circular shape allows the bottom of a circular pipe to be filled with sediment and thus limit its flow capacity. The Custom Closed Shape allows any closed geometrical shape that is symmetrical about the center line to be defined by supplying a Shape Curve for the cross section. where n is the Manning roughness coefficient. 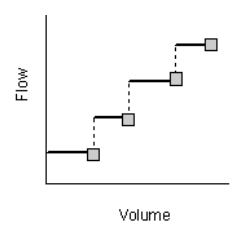 The slope S is interpreted as either the conduit slope or the friction slope (i.e., head loss per unit length), depending on the flow routing method used. where g is the acceleration of gravity and f is the Darcy-Weisbach friction factor. For turbulent flow, the latter is determined from the height of the roughness elements on the walls of the pipe (supplied as an input parameter) and the flow’s Reynolds Number using the Colebrook-White equation. The choice of which equation to use is a user-supplied option. A conduit does not have to be assigned a Force Main shape for it to pressurize. Any of the closed cross-section shapes can potentially pressurize and thus function as force mains that use the Manning equation to compute friction losses. A constant rate of exfiltration of water along the length of the conduit can be modeled by supplying a Seepage Rate value (in/hr or mm/hr). This only accounts for seepage losses, not infiltration of rainfall dependent groundwater. The latter can be modeled using SWMM’s RDII feature . inlet geometry code number if the conduit acts as a culvert (optional). Type2 An in-line pump where flow increases incrementally with inlet node depth. Type3 An in-line pump where flow varies continuously with head difference between the inlet and outlet nodes. Type4 A variable speed in-line pump where flow varies continuously with inlet node depth. An “ideal” transfer pump whose flow rate equals the inflow rate at its inlet node. No curve is required. The pump must be the only outflow link from its inlet node. Used mainly for preliminary design. SWMM can model the following types of flow regulators: Orifices, Weirs, and Outlets. Orifices are used to model outlet and diversion structures in drainage systems, which are typically openings in the wall of a manhole, storage facility, or control gate. They are internally represented in SWMM as a link connecting two nodes. An orifice can have either a circular or rectangular shape, be located either at the bottom or along the side of the upstream node, and have a flap gate to prevent backflow. 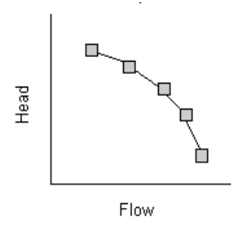 where Q = flow rate, C = discharge coefficient, A = area of orifice opening, g = acceleration of gravity, and h = head difference across the orifice. The height of an orifice’s opening can be controlled dynamically through user-defined Control Rules. This feature can be used to model gate openings and closings. 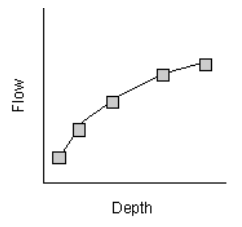 Flow through a partially full orifice is computed using an equivalent weir equation. time to open or close. Five varieties of weirs are available, each incorporating a different formula for computing flow across the weir as listed in Table. The Roadway weir is a broad crested rectangular weir used model roadway crossings usually in conjunction with culvert-type conduits. It uses curves from the Federal Highway Administration publication Hydraulic Design of Highway Culverts Third Edition (Publication No. FHWA-HIF-12-026, April 2012) to determine CW as a function of h and roadway width. Map Labels are optional text labels added to SWMM’s Study Area Map to help identify particular objects or regions of the map. The labels can be drawn in any Windows font, freely edited and be dragged to any position on the map.